• For quantitative determination of choline and evaluation of drug effects on choline metabolism. 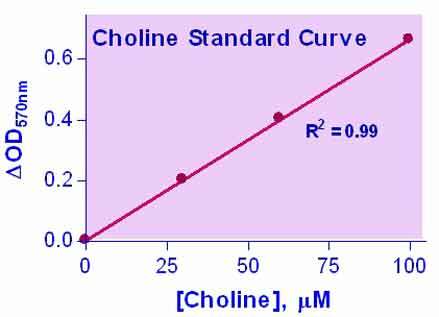 • CHOLINE and its metabolites play important roles in membrane structure integrity, cellular signaling and cholinergic neurotransmission. Aberrant regulation in choline metabolism has been associated with mental illness such as anxiety. BioAssay Systems method provides a simple, direct and high-throughput assay for measuring choline in biological samples. In this assay, free choline is oxidized by choline oxidase to βine and H2O2 which reacts with a specific dye to form a pink colored product. The color intensity at 570nm or fluorescence intensity (530/585 nm) is directly proportional to the choline concentration in the sample. 1. What are known interferences? Chondroitin sulfate C (chondroitin-6-sulfate) appears to interfere with the assay; creating false positive results.